Sue graduated from East Carolina University in 1999. She has worked as an Occupational Therapist in pediatrics for over seventeen years with a focus on the birth to five-year old population. She served as the staff OT at the Easter Seals UCP Charlie Gaddy Children’s Center for over 12 years. 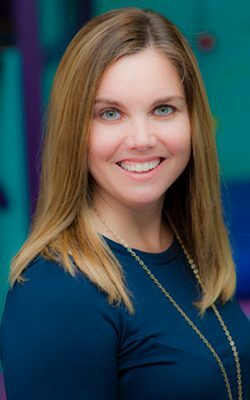 She has great experience working with children with a variety of diagnoses including sensory processing disorders, Autism, Down Syndrome, TBI, Cerebral Palsy, and developmental delays. Sue has focused her career in the area of sensory integration and applies this knowledge to all therapy interventions. She uses a sensory-motor approach to improving individual’s functional outcomes by impacting their sensory system. She desires to obtain overall improvements in all developmental areas by addressing the sensory system. She loves to be a part of each child’s individual progress and journey. She has certification in the Sensory Integration and Praxis Testing (SIPT). She is trained in Therapeutic Listening and Handwriting Without Tears Pre-K program. She is a certified Interactive Metronome trainer. Sue has finished level 2 course work for Cranial Sacral Therapy and uses these techniques during therapy sessions as well. Sue is the owner and director of a private practice, Kid Sense Therapy, serving children in the community as well as serving children in their child care center. She is thrilled to now be able to serve kids in the clinic setting as well. She loves to work with children in their home, school environment and clinic. She works closely with all caregivers to help carry out all therapy techniques throughout the child’s day for greater success. Sue is married and has a thirteen year old daughter and a 10 year old son. She loves to spend time playing with her family, Coaching Middle School basketball, and enjoying the outdoors and parks of our wonderful Raleigh area.